There’s more than one way to ride around Anglesey. Penmon Point, Anglesey, was deserted that Bank Holiday Monday evening. The beach looked firm, and in my mind’s eye it was straightforward – down the slope, along the pebbles, swing left over the high tide mark, into a depression, up onto the road and home. 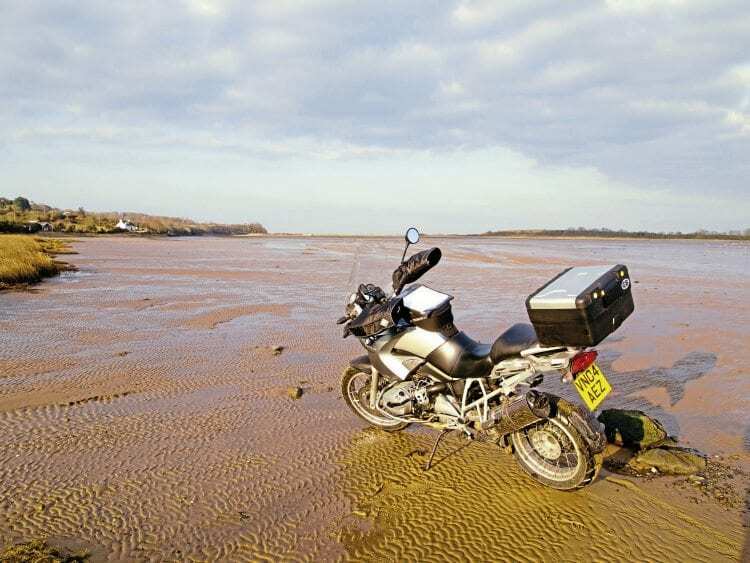 In the real world the rear wheel of my BMW R1200GS had dug itself into a deep hole. Bank Holidays present options, and mine was to circumnavigate Anglesey. Not the two hours of big roads with a tea stop in Amlwch but the quiet unclassified roads that go nowhere. The south coast, with snow-capped Snowdonia on the horizon. LlanfairpwIlgwyngyllgogerychwyrndrobwllllantysiliogogogoch, the little village with a big name, is just over the Britannia Bridge, and where I stopped to look at the map. A number of coastal dead-ends were circled in blue ink, linking my fluid notion of travelling all the way round the island with finding places I’d never been before. Half a kilometre along Brynsiencyn Road led to the Menai Straits and Carloe Randall’s studio where she produces two-dimensional interpretations burnt into metal plate. She also seemed to be expecting me, which was spooky. 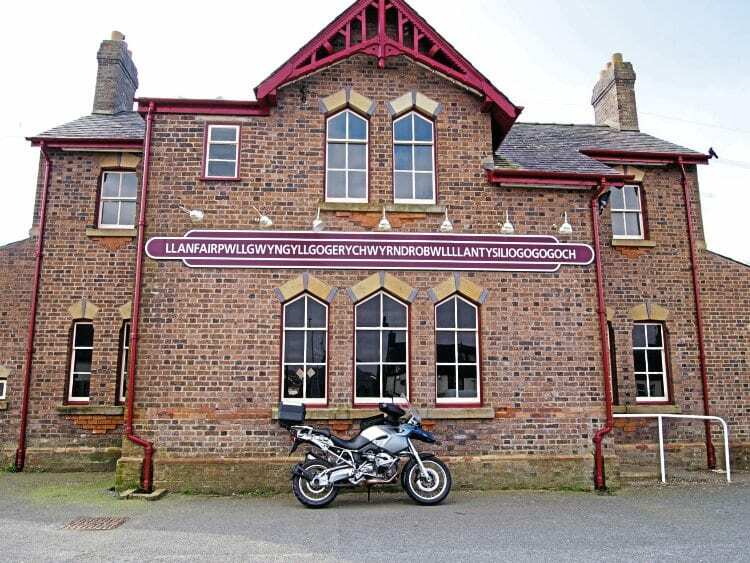 Llanfair… well you know the rest. Newborough Warren has three dead ends and a lot of rabbits. The sun warmed the day as I settled on a dune for a picnic lunch and an early afternoon nap. The Warren sits on 23 square kilometres of dunes and marram grass and has a Site of Scientific Special Interest, which is home to red squirrels. Spot the Church in the Sea – it gets cut off at high tide. Back on the A4080 to Crigyll Beach and then 16.3 miles of lanes to South Stack lighthouse. The little road on the left out of Rhosneigr boasts the official Highway Code road sign with the tilting car in the red triangle; always good to follow on an adventure bike. 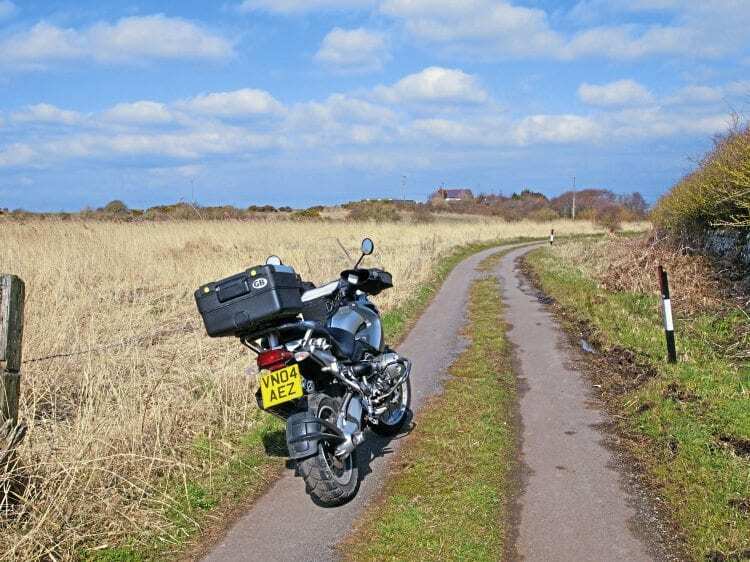 Avoiding grass and mud in the middle of the lane, I crossed Four Mile Bridge onto Holy Island, lingered in Trearddur Bay and rested at South Stack. 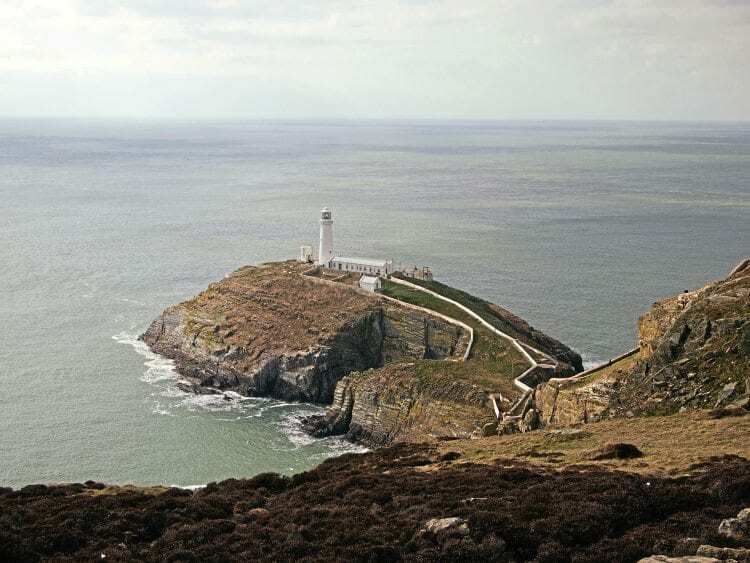 The lighthouse is a tourist magnet and a vital first marker along the treacherous shipping lanes of the Dublin-Holyhead sea route. Heading north, I found the A5025 at Valley crossroads to follow the north coast with its beacons keeping ships safe on their way to Liverpool. You can see them all from the main road but the dead end at Trefadog held promise of a sealed track to Church Bay. Perhaps in 1988 there was tarmac but now it had deteriorated to mud. I turned back. 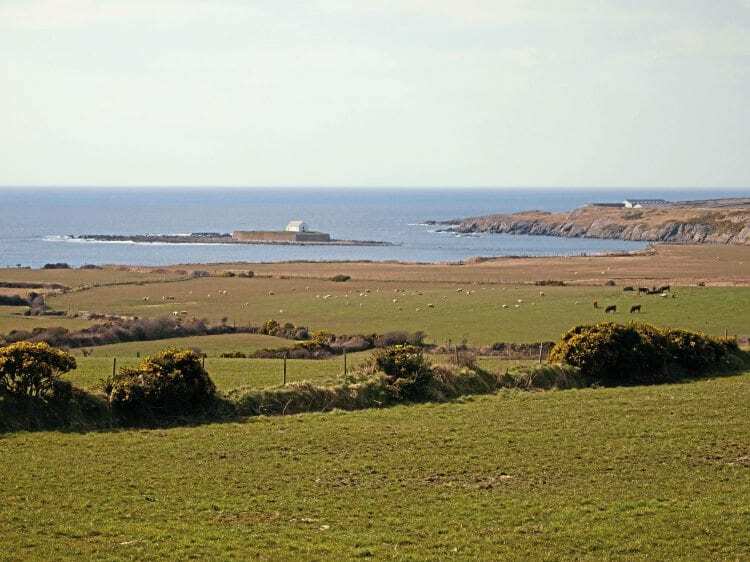 Church Bay is picturesque with a northern ruggedness in contrast to the south, and the geology of Anglesey is notably complex. Schists and phyllites of ancient Precambrian bedrock support younger strata. Grass-grown dead end lanes to nowhere – just what Andy wanted. The small roads delight from Church Bay to Llanfairynghornwy below the Monument on Mynydd y Garn, erected in 1897 to commemorate Sir William Thomas, the High Sheriff of Anglesey who philanthropically pumped profits from his Merseyside businesses into the local community. For the next point of interest, keep the landmark on your right as grass appears up the middle, turn right and then left in the village. Cemlyn Bay Nature Reserve was deserted but has the added excitement of a car park, which floods at high tide. Checking the time underlined how slow these dead ends make progress. It was 6pm, and only two hours to dinner time. 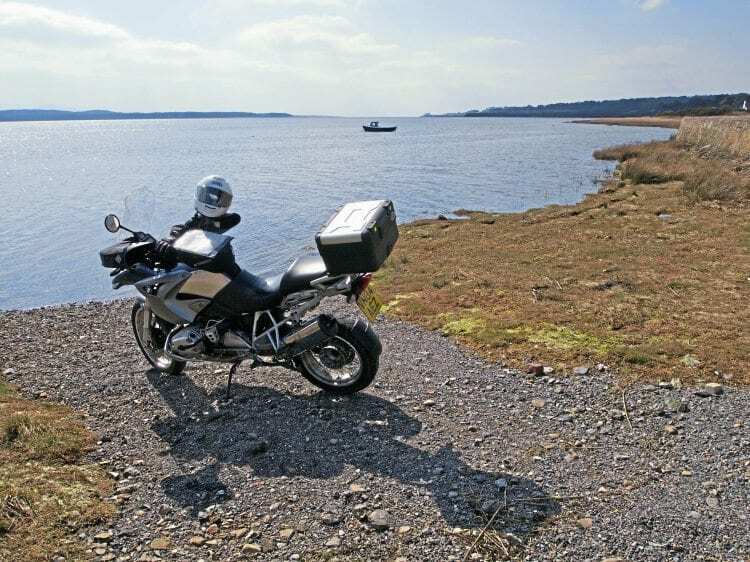 So a change of plan – I would stick to the big roads now, to Beaumaris and the A55 back to Wirral. I’d be home on time… perhaps. The tide was well out as the unkempt tarmac turned to sand down on Dulas Beach. Parallel stone markers impersonated a roadway along the north bank of the Mon Goch (Red River) estuary extending the impression of tarmac into the wilderness. The foreshore beckoned with Ynys Dulas (Seal Island) just visible out to sea. I followed it until the stones ran out. The pebbles sprayed like shrapnel, we slowed, until the drive shaft rested on the stony beach. I dismounted, and the bike remained upright without my support, ensconced in its own trench. No tourists appeared this time, so I’d have to deadlift 230kg of German technology out of the hole. I smiled. Andy, I thought, you are such a plonker. Anglesey had given me a day to write home about. The weather had been forgiving, the views stunning, the map reading involving and the roads rewarding. Snowdonia glistened with snow as I headed back over Menai Bridge, the A55 was quiet, Colwyn Bay services had petrol and I was home in time for dinner. 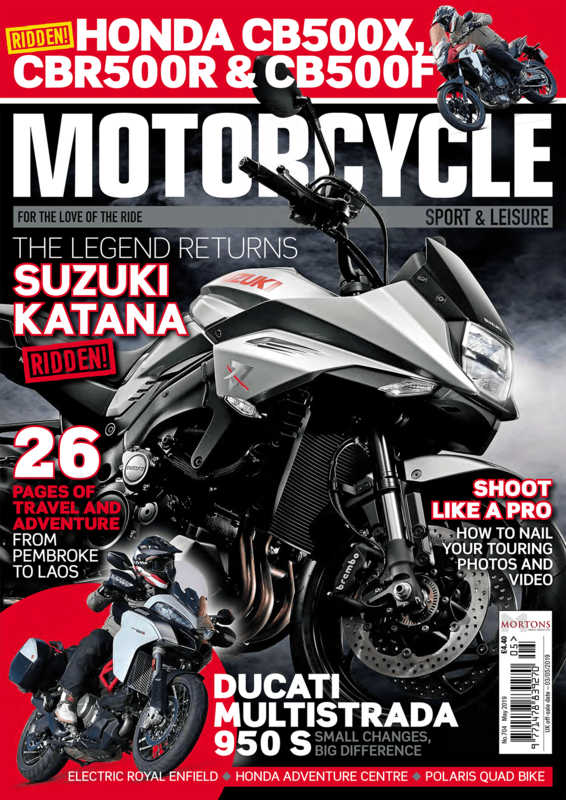 Next Post:MSL October 2018 out now!